Purple hands with a red heart and a student’s name can be seen adorning the halls of Blue Hill Elementary School. If you have been in the building, you may have been wondering what these hands symbolize and how this impacts our students. 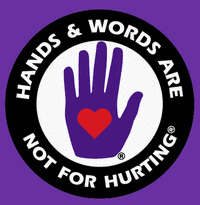 The “purple hands” symbolize the pledge - “I will not use my hands or my words for hurting myself or others”. The Purple Hands Pledge is a promise that students make every day to make better choices and decisions that solve problems without violence. The pledge was created in 1997 by Ann Kelly to "encourage dialogue about all forms of abuse and violence…from name calling, belittling, put downs, and negative self talk - words that can escalate to suicide and/or murder." The Purple Hands Pledge has been “implemented as a daily reminder that each and every one of us needs to be treated with dignity and respect” says Elementary Guidance Counselor, Kirk Ramsey. Mr. Ramsey has diligently been working with kids this year to simply be kind to each other. As parents, we encourage you to talk to your kids about what the Purple Hands Pledge means! There will be a PK-6 “Purple Hands” celebration assembly on Monday, October 29th at 10:00 a.m. in the elementary gym. Parents and community members are welcome and encouraged to attend!